Saying “I do,” in a comfortable, rustic backyard can be a perfect start to a lifetime of domestic bliss and a great way to treat your friends to a beautiful reception in a warm, homey atmosphere. Not only are backyards a perfect place to tie the knot, they can also be a great location that does not cost as much as traditional reception areas. There are as many types of backyard receptions as there are couples, and the options are endless when it comes to decor. 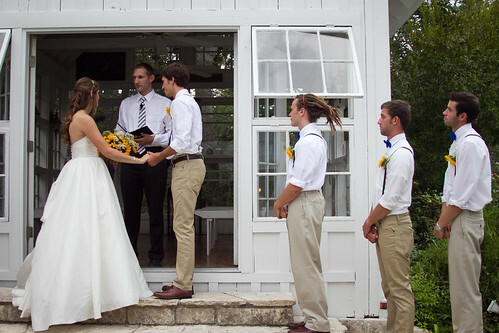 Here are a few tips for the DIY backyard wedding of your dreams! One of the best things about a backyard wedding is the chance it gives you to spend your special day in a location that has meaning for you and your family. Highlight the importance of the location and the significance of the house by adding touches that are nostalgic and meaningful. Try stringing together old family photos or using clothes pins to clip them onto a string and hang them between two trees. You can also decorate the bridal party or sweetheart table by using an old family heirloom or framed photo as a centerpiece. You can quickly and easily transform any backyard into a reception area by adding canopies. Try foldable shade canopies, which can be very easily set up and are a great way to keep food covered and to allow guests to sit in shady areas on hot summer days. You may even want to consider getting enough canopies for all of your tables, in the event that rain strikes mid event. Mason jars are inexpensive and can be used in a number of ways to give an event a rustic chic feel. If your reception will be at night, try placing small candles in the jars for a magical firefly effect. You can also fill jars with trinkets or candies, or cut flower stems short and use the jars as vases. These jars can also be used to serve beverages. The possibilities really are endless! Wildflowers are a great way to add dramatic splashes of bright color and work perfectly to accent the casual beauty of a backyard reception. They also look great in loose bunches and don’t require any sort of formal arrangement, so it’s easy to create beautiful centerpieces on your own without the assistance of a professional florist. You may also want to try other unconventional accents with the flowers, like pinecones or acorns, which can be scattered across tables or tied to ribbons around bunches. White Christmas lights are an easy and very inexpensive way to add instant elegance to any locale. Try stringing them around trees or canopies or draping several strands of them above the dance floor. There are many different shapes and sizes of Christmas lights, and small globe shaped bulbs can add a nice classic touch. Kellie Swaim is a Marketing Associate for Quikshade who has picked up wedding planning as a hobby and finds new and innovative ideas to share with people who are looking for ways to have an intimate and cost-friendly wedding. For more information click here.